Mount Anderson’s spectacular environment supports a vast variety of animal and plant species. At the higher altitudes, where water seeps from sponges or between rock fissures, the resultant marshes host their own unique ecosystems. Here you will find vegetation that has adapted to living in permanent wetland, and the dominant greenery consists of sedges – grass-like plants with characteristic inflorescent crowns on tall straight stems. This is a popular habitat for frogs and toads, as well as shrews and moles. Dragonflies and the less sedentary Damselflies can be seen on warm days. The streams are home to such secretive creatures such as the Vlei Rat, Water Mongoose, and two Otter species. The Water Mongoose feeds on crabs, and the presence of crab skeletons in the small middens (dunghills) is usually the only evidence of mongoose presence. Ferns and mosses grow in profusion where the rocks are kept damp by the splashing water. The largest fern to be found is the Tree Fern, and there are fabulous specimens on Mount Anderson. Walking along the grassy slopes is rewarding for lovers of birds and wild flowers. The grassland is undisturbed with a predominance of the palatable Rooigras. It is on the upper grassland slopes that one may see herds of grey rhebok, mountain reedbuck, jackals, black wildebeest, zebra, eland and blesbuck. Mount Anderson has an enormous variety of species of plants, wildflowers and trees – too plentiful to mention. 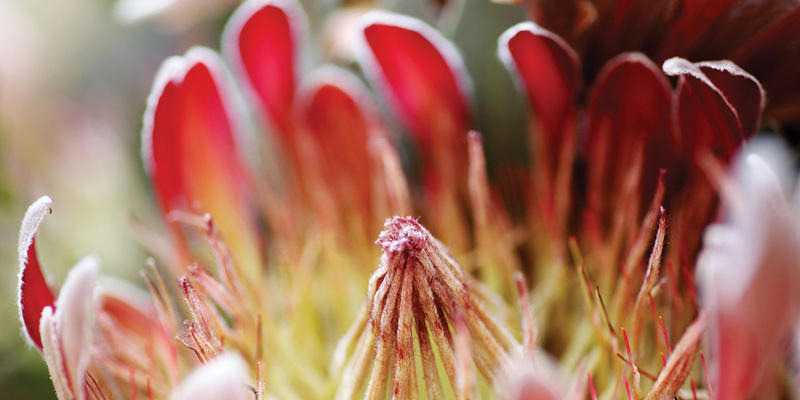 Here you will find anything from two species of Protea – the Common Sugarbush and the Transvaal Silverleaf, Wild Orchids, Red Fuchsia, Cape Holly, St John’s Wort, Aloes, Gladioli, Pineapple Flowers, Hard Fern, and a variety of indigenous trees including Oudehout, several Rhus species, Paresley Trees, Buddleja, the Common Sugarbush and the Transvaal Silverleaf – to mention a mere few. Hanging Aloes flower over the cliff faces where the numerous baboons on the property hide away. On the high cliffs of Kranskloof near the gold mining excavations and overlooking the Ohrigstad Dam, lives a breeding colony of the rare Cape Vulture, whose numbers have declined dangerously in recent decades due to the reduction of naturally available food and a high mortality rate as a result of poisoning or being shot by farmers who incorrectly believe that the birds prey on livestock. Other birds to be seen are the greeny-blue Malachite Sunbirds, Cape white-eyes, Gurney’s Sugarbird, raptors, swallows and swifts. Rustling in the long grass you may spot francolins, including the unusual Greywing and Redwing species. On Mount Anderson are a few outcrops of diabase – the volcanic rock that rose to the surface when the Bushveld Complex was formed some 2,000 million years ago. The rocky outcrops consist of large boulders that shelter lizards, including the striped skink. Large quartzite crystals are home to various succulents, while the damp climate encourages the growth of lichen of many colours. Mount Anderson was re-stocked with a number of species of game that formerly existed in substantial numbers before commercial hunters brought destruction to the wildlife herds of southern Africa in the nineteenth century. Some of the farm names in the vicinity bear testimony to the sad demise of this wildlife frontier: Olifantsgeraamte – the elephant’s skeleton – which is south-east of Mount Anderson, is reputed to have been the area in which the last elephant in the district was shot, while the neighbouring farm, Rhenosterhoek, is reportedly where Petrus Coetzer shot the last rhinoceros in the 1870s.